You may have seen in the news that a public engagement effort seeking suggestions for the UK’s £200m new polar research ship has gone somewhat off course. 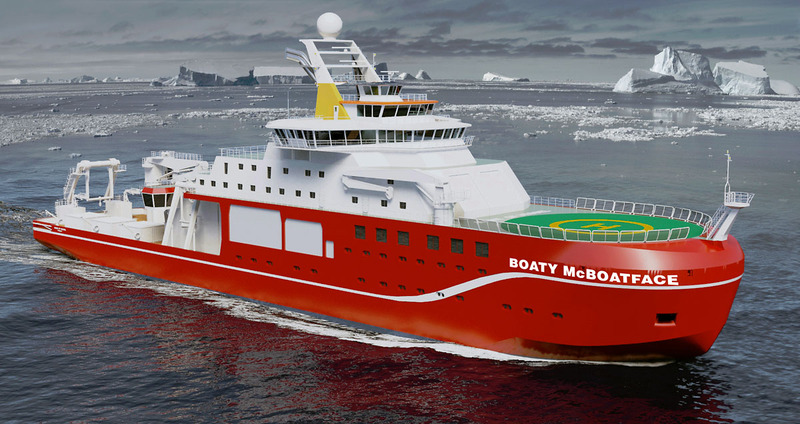 Topping the leaderboard by tens of thousands of votes, steaming ahead of eminent explorers and majestic Arctic phenomena, stands RRS Boaty McBoatface. But Boaty may be sailing in troubled waters. She’s a piece of ‘science capital’, the name given to new laboratories and major pieces of scientific equipment, but not the staff and consumables used to run them. And a damning report earlier this month from the National Audit Office suggested that the government’s funding of science capital over the last five years has been anything but ship-shape. First, let’s put this ship in context: her £225m cost over her 25–30 year lifespan, divided by the 65m people living in the UK, comes in at around 10p per UK citizen per year. Surely little (15,000 tonne) Boaty is worth that! It’s certainly a drop in the ocean next to the likely costs associated with climate change, something a new polar ship will help us investigate. She’s also small change compared to the roughly £11,000 per person per year of total government spending. This is one reason that politicians like to announce big, shiny new labs or pieces of kit: they’re cheap in the grand scheme of things, and they’re great PR because the public loves science. Of course, it isn’t quite as simple as that. The £225m figure is only the cost of building Boaty in the first place. A crucial additional cost is the so-called ‘resource’ funding required to run McBoatface: scientists to perform the experiments, consumables, equipment repair, and so on. This was one area in which the National Audit Office was highly critical of the government: ‘recently approved business cases have lacked key analysis, such as information on what projects could cost to run or assurance on how ongoing costs will be funded’, explained the report’s summary. With resource funding frozen until 2020, new facilities could be forced to run on the cheap, or eat into current research programmes. In the absence of proper planning, there’s no way to know which (if either) it will be. The other major criticism was that choice of which projects to fund was made without the requisite base in evidence. Much of the money was announced at short notice, not giving enough time for proper consultation with the wider scientific community about where investments are most needed. This is also an area where public engagement could play an important role: rather than simply asking for suggestions for the name to paint on her prow, we could ask the public whether they’d like to see their 10p per year heading to climate science or chemistry, stroke research, or searching the cosmos for gravitational waves. We could even go so far as to ask whether the public would like to put more than just handfuls of pence per person per year towards these goals, which range from the fascinating and open-ended to the health-giving and economy-bolstering. In the meantime though, let’s revel in imagining the scene in 2019 as the Science Minister smashes a bottle of champagne over our new polar research ship, the RRS Boaty McBoatface. We can also hope that the combination of a stern rebuke from the National Audit Office and this delightful bit of tomfoolery from the public might convince the government to have a more serious discussion about science funding.